Spurred by wars and a drive to urbanize, Africans are crossing borders and overwhelming cities in unprecedented numbers. At the center of this development are young refugee men who migrate to urban areas. 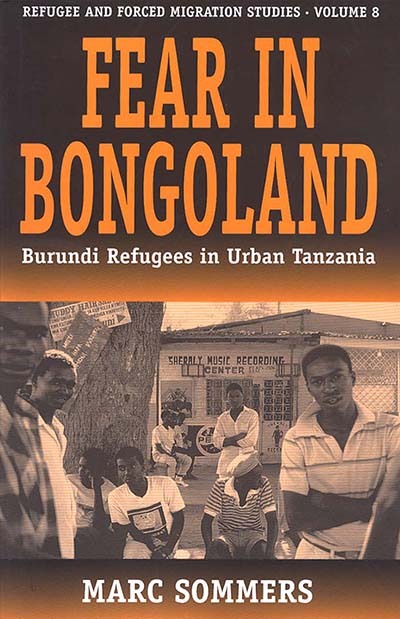 This volume, the first full-length study of urban refugees in hiding, tells the story of Burundi refugee youth who escaped from remote camps in central Tanzania to work in one of Africa's fastest-growing cities, Dar es Salaam. This steamy, rundown capital would seem uninviting to many, particularly for second generation survivors of genocide whose lives are ridden with fear. But these young men nonetheless join migrants in "Bongoland" (meaning "Brainland") where, as the nickname suggests, only the shrewdest and most cunning can survive. Mixing lyrics from church hymns and street vernacular, descriptions of city living in cartoons and popular novels and original photographs, this book creates an ethnographic portrait of urban refugee life, where survival strategies spring from street smarts and pastors' warnings of urban sin, and mastery of popular youth culture is highly valued. Pentecostalism and a secret rift within the seemingly impenetrable Hutu ethnic group are part of the rich texture of this contemporary African story. Written in accessible prose, this book offers an intimate picture of how Africa is changing and how refugee youth are helping to drive that change. Marc Sommers is an international consultant and Research Fellow at Boston University's African Studies Center. He has explored the impact of war and urbanization on children and youth in Africa as well as Colombia, El Salvador and Kosovo. Dr. Sommers has published numerous articles and reports for popular and scholarly audiences and presented on Capital Hill, at the United Nations and on radio programs. His photographs have been exhibited in the U.S., Europe and East Africa. In 1993, Dr. Sommers received the annual Award for the Outstanding Paper on Refugee Issues from the American Anthropological Association's Committee on Refugees and Immigrants.